But similar to skydiving, life is full of ups and downs. To pursue her fashion dreams, Ryder earned a degree in marketing/advertising and landed a job in Dillard’s management training program. The only problem was she didn’t enjoy having to work holidays. This led to her becoming a contracts administrator at Pitney Bowes, and it wasn’t until she volunteered to do some legal research for a relative that something else clicked altogether. “I liked the work and, on a whim, decided to take the LSAT,” she says. “I envisioned myself as Perry Mason, but after one mock trial in law school, I realized that wasn’t for me.” An FCC internship introduced her to media law in 1994 during two momentous events for the agency: its investigation into Howard Stern and Clear Channel (now iHeartMedia) and its adoption of children’s programming regulations. “That experience taught me a lot about pubic airwave regulations,” Ryder recalls. 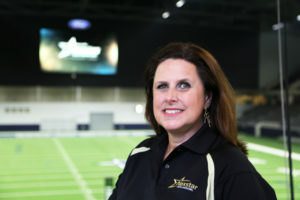 In 2007, First Broadcasting in Dallas hired her as vice president of legal affairs. The job got her back to Texas and showed her the benefits of in-house work. “I didn’t have to bill my time in six-minute increments or try to keep a lot of different clients happy,” she says. When Ryder joined in 2009, Nexstar operated or provided services to forty-two TV stations. To this day, it is the nation’s second-largest independent owner, with 170 stations in one hundred markets. The company’s largest growth spurt came with the $4.6 billion purchase of Media General in early 2017. Nexstar serves 39 percent of US households, which is the current ownership cap set by the FCC. However, in April 2017, the FCC voted to ease the rules by reinstituting a discount for UHF stations, which takes the cap to 78 percent. There have been judicial challenges, though, and the rule change is currently before the DC Court of Appeals. If the change goes through, Nexstar, along with several other companies, is expected to look for new accretive opportunities. Simultaneously, the company is also being required to relocate ninety of its television stations to new channels. This is a result of the spectrum auction, where broadcasters sold some of their spectrum to companies such as T-Mobile, Comcast, and DISH Network. One could imagine that all of this would provide enough of a challenge, but Ryder decided to keep her personal life as invigorating as her professional one by taking up skydiving. She had just started working at Nexstar when a friend told her that jumping out of a plane was on her bucket list. Ryder soon asked to join her on a jump. “That first tandem jump was sensory overload,” Ryder recalls. “I thought it was really cool and wanted to do it over and over again.” She was hooked—in more ways than one. “The instructor was so great. In fact, I married him,” she says. Ryder earned her A license so she could perform group jumps, then completed the fifty jumps and other requirements for a B license, which entitles her to jump from specialty aircrafts and at night. “Night jumps are extremely calm and peaceful, though, my depth perception can be a problem on landing at times,” she says. “Jumping out of hot air balloons is also very cool, but you have to deploy your parachute very quickly. A B-25 was probably the most exciting jump. It was sheer luck that we got to do it. We just happened to be in the right place at the right time.” It’s a sentiment that pretty much sums up her life so far, she notes. It’s a great feeling for Ryder to know she has landed well, not only at work, but also in her life outside the office.